Pioneer organization in the trade, import and wholesale of Plotter Cut Cloth Transfer Film, we have become a leading company. The offered range of these transfer films is extremely versatile and highly reliable. Our hired pool of the industry experts do thorough checking of these transfer films to ensure that these adhere to the level of the industry. At last, we guarantee that these plotter cut cloth transfer films would not only meet your expectations but would even go beyond them. Formed in the year 2004, our firm has attained a strong market position in trading and wholesaling a wide range of products. The range we offer comprises Holographic Film & Foil, Reflective Products, Vinyl & Radium Films, PVC Films, Decorative Film and Material, Industrial Packaging Materials, & Zippers. All these products are sourced from trusted vendors of the market, who make use of high quality raw material in the manufacturing process. The sheets offered by us can be availed in varied colors, sizes, designs and known for their fine finishing and dimensional accuracy. Available in customized forms, all our offered products are widely used in a number of garment designing, bag manufacturing, shoe making and printing industries. 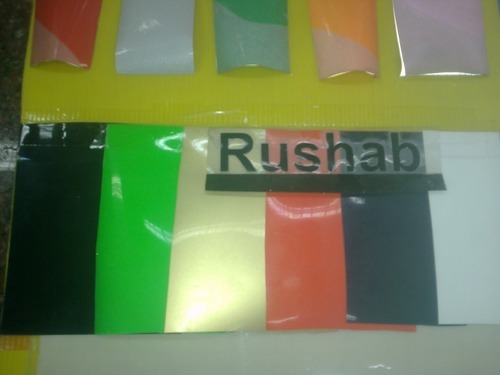 The films & foils that we offer are appreciated for their excellent clarity and tensile strength. Our association with leading manufacturers enable us in meeting the diverse requirements of the customers. It is the brilliant knowledge of our skilled procuring agents that assists us in bringing forth quality assured products. Moreover, we make sure to undertake all our workings under the guidance and norms of the industry thus, maintaining the quality standards at every stage. Facilitating clients with easy payment modes like cash, cheque, DD, invoice and credit card, helps in having hassle free transactions. Furthermore, on time delivery of consignments via air is also ensured at our end.